Do you work for Sublime Text? Learning about Sublime Text? We can help. "Gran editor de código ligero"
La aplicación es multiplataforma y nativa, por lo que el comportamiento de la aplicación es exactamente el mismo en Windows y Linux. Tambien es muy ligero tanto el instalador como el programa cargado en la memoria, creo que este es su punto fuerte y lo que lo hace tan ligero y rápido. +El bajo consumo de CPU y RAM para ser ligero no requiere una gran cantidad de memoria para usar, excepto lo que necesita para los archivos que abre para editar. Lo que no me gustó de la aplicación es que aunque es opcional comprar la licencia de vez en cuando y al azar aparece una pequeña señal que lo invita a su compra, esto no parece negativo en sí mismo, pero creo que si al menos la aplicación fuera El código abierto ganaría mucho más cobrando licencias porque vendería más. Recomiendo esta aplicación si está buscando un editor de texto ligero y muy rápido, que pueda manejar archivos de una gran cantidad de líneas sin bloquear ni bloquear, ni siquiera el retraso. La licencia es opcional, así que puedes probarla gratis. Uso Sublime Text para cualquier edición de archivos de configuración o para editar archivos que contengan código (principalmente php o java) y hágalo rápidamente. Obviamente solo edito archivos de código que no necesitan compilación de código porque no tiene compilador incorporado. Sublime text editor is one of the best tool to develop project or software in php. Sublime provide many feature like it provide different color combination for good presentation of code, It is totally free software so developer can easily download it. It also provide auto fill functionality so developer do not have to remember syntax for developing. Find and Replace function is also working fine so it made developing fast. Documentation is also good so any problem occur than user can read manual to resolve that. It is free but still provide notification for buying purchased version which is not comfortable while developing. There is no other thing to dislike about it. Anyone who want to develop website or project in PHP they can use this tool, it is completely free and it provide total support to developer so code is made efficient way. I work with sublime since 4 year and i develop many website and php project in that. It is best tool to develop any website it always help to represent our code in good way so other person not confuse in that. "Lightweight and easy-to-use editor for coding source codes"
I have been using sublime text for several years and I can say that it is a very useful software for me because it allows me to open files of different programming languages, I can add add-ons and also configure shortcuts to work more comfortably, its interface is quite simple, it helps me to work better, in terms of its characteristics that I like most is its autocomplete which helps me write faster. It does not always detect the programming language of the file that I try to open, besides I had some unexpected closures in some of its previous versions, I would like that in its options there was an option to organize the code automatically. 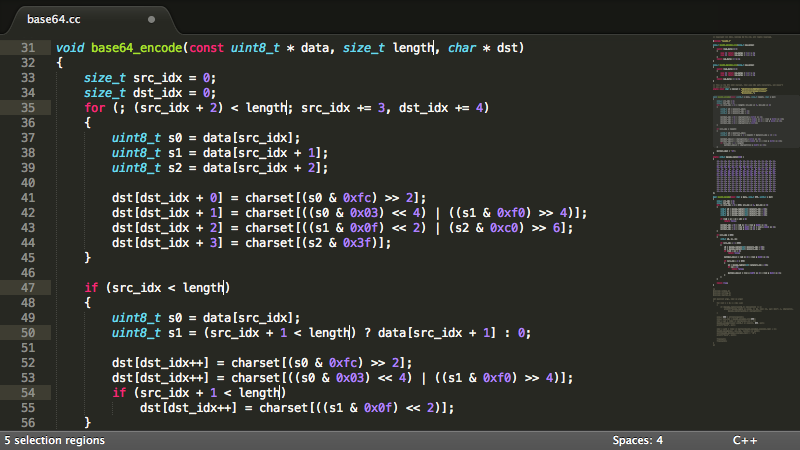 Sublime text is an excellent editor, it has a Premium version, but it has an unlimited free to try its full potential. Sublime text has offered me excellent benefits in terms of programming since with it I have been able to develop many applications and websites, it is also very helpful because it is very customizable and I can run it on computers with few resources. "Cool text editor for code editing"
It run on almost every computer,due to its low computer requirements. The default theme sublime is beautiful,it also provide many different interactive themes. Although it is a very good text editor but when you are doing complex programming then you required a good debugger which sublime text don't have. This editor solved all the issues which i had with other text editor. It is free software you don't have pay much for this software. It is a powerful, stable and capable of opening files of millions of text lines without the application crashing. "An essential tool with a wide range of features." Sublime Text is a multi-platform text editor with robust functionality, which is mainly directed to programmers, who value simple and convenient work tools. It provides all the necessary functions, allowing the programmer to write and edit files with the source code efficiently. A significant advantage of Sublime Text is a huge possibility of configuration and customization the editor to meet the personal preferences of the user. You are able to extend the program by plugins and macros, which expand the editor's capabilities, as well as streamline specific tasks. The application comes equipped with syntax coloring feature for the most popular programming languages. SublimeText has several timesaving facilities implemented such as a multiple tab mechanism that allows you to work with multiple files simultaneously. 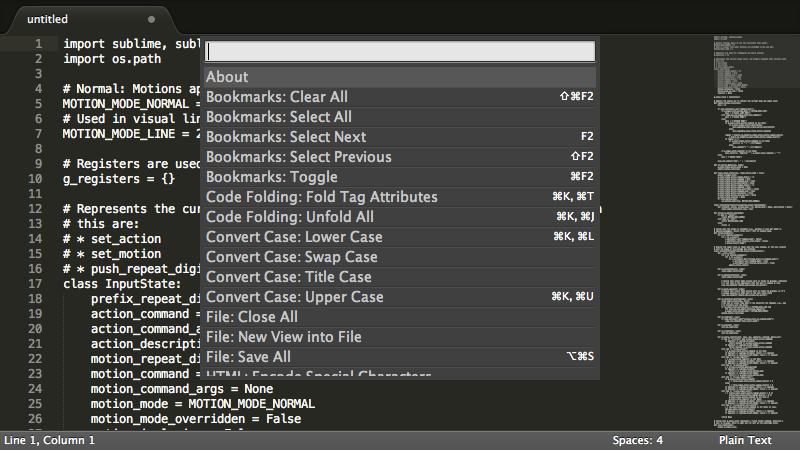 Sublime Text supports keyboard shortcuts that facilitate performing of frequently repeated actions. It might be annoying that everytime you save a file, there is a pop-up window appearing that you are using a free version and there is a possibility to pay them to support their development. Personally, SublimeText is the best text editor for web development, so if you are looking for an excellent tool with timesaving features, you might consider the software. As a web developer, Sublime Text is an essential part of my tool set. It enables me to design websites efficiently as well as work in a convenient work environment. "Best Text Editor For PHP "
Sublime is one of the best text editor for PHP and website development. It provide good color combination for function,and variable so we can also easily identified them. It also provide different tab size for making code presentation very attractive. It also provide suggestion for different function syntax so developer do not have to worry if they forgot any syntax. Find and replace system is also very good in this tool. It also provide good documentation about tool so any time we can see it if any problem occur. It is free tool but it also provide notification about purchased version which is not necessary to buy. There is no other thing to dislike about it it provide good facility for developer. My Recommendation to all developer who develop website in PHP They can use this text editor because it is very good for web development. It is free of cost and provide all facility so student or company can use this tool. It is very easy to use so user do not have to learn from anyone, for learning purpose they can use documentation so it is very comfortable for every programmer. I am currently working on one website in which we use sublime as our main text editor. I also made many website using PHP, HTML, CSS, and Java Script in which i use sublime as my text editor, it is very good for programming. "A very useful and easy to use text editor." Sublimetext is the best text editor I have used, at the time of programming it is my first option. Its interface is friendly so it is easy to use, it has a very good number of keyboard shortcuts that allows me to quickly access any program complement or perform any operation that I want, which is great since for us the programmers, Sublime Text saves us a certain amount of time! The color scheme that applies depending on the programming language you use is very helpful because it gives me an incredible way to read the code documents because at a glance you can visualize all the elements without even reading them. The facility to organize the code when formatting it is wonderful, it is very easy to apply tabulations. I think that every programmer should at least try to use this wonderful tool and I am almost certain that from this it will be his faithful ally of work! It is a bit annoying that every time I save a file a certain number of times, a pop-up window appears reminding that it would be good for your developer to pay to use it. When I try to download a pluggin I sometimes get error messages that the download was not made, I have to close the editor, reopen it and try to download again so that the download can be made. I am currently developing web pages and it has helped me a lot because it allows me to keep my code organized, I use different plug-ins such as EMMET or Colorpicker which speed up the time I take when coding, besides that through them I avoided writing mistakes and that's great! "Ideal text editor for all types of developers." Sublime is a very complete tool to carry out all types of computer projects, it has an advanced ideal interface, for developers and programmers of all kinds, which allows creating all kinds of contents based on codes in a faster way and easy to carry out, thanks to the distribution of text that the editor has, and also that this account has different preinstalled development features, such as python that allows the development of applications within this same application, the freedom of Text editing within this fantastic applications and does not limit the developer in any way. Some complements are a bit complex to install, since they must be installed by means of codes, this is more focused on programmers, but they must take into account that it is an application that designers also use, and we are not experts in that subject, we only they do lose some time, doing searches on the internet about installation manuals of some additional feature that we want to install, in some cases I noticed that the application tries to edit certain types of codes in its own way, giving a self correction to the code that is elaborating, which does not always work in the best way, and can cause some inconvenience, in certain cases and had to check my code because something does not work, and what a surprise, I realize that the same software was the one that changed something in my code, because I thought it was not right. A text editor where you can have more freedom to perform all kinds of projects, having a better view of what is being developed, observing each detail with greater precision. I can edit my code for my different projects, in a more orderly and detailed way, it is not the same to work in this application as to do it directly on the web, or in the native text editor for windows, here you can see all the details of the code, which allows to find faults in a faster and easier way, and to clearly detail what is being done. "A very useful free code editor"
As a user of Sublime Text in its latest version for several years in my opinion we are facing one of the best applications of this type, a versatile code editor, fast and simple but with great power to perform all kinds of tasks. Although it is not an IDE or an advanced code editor such as VScode since it lacks some functions such as auto completion by default (it is possible to install plugins to enable it), it is possible to manage projects without any problem. - Customization of the graphic interface of the application and its content, such as fonts and colors. In all the time that I have been using this application I have not found anything that is worthy of qualifying as negative, bug or something that I do not like about it. I suggest you use Sublime Text on other code editors due to its low consumption of resources compared to all the possibilities it offers in terms of project management or editing of all types of files. In addition, the application does not have any additional cost since the license is optional. "Sublime Text- Fast And Easy To Use Text Editor With Good GUI"
Sublime is a very good text editor. It has good GUI and color scheme so that you can easily recognize component according to different programming languages. It has various theme with help of this you can easily work at night without having burden on your eyes. It has various panels and navigation options so it is easy to navigate and edit your document. It has one wonderful features of multi-cursor. You can use more than one cursor pointer at a time and edit multiple places simultaneously. Sublime is work as expected and performance is also good. It is very helpful for a programmer but I have found one fault or issue - It is randomly asking for purchase and I have to unfortunately close that window and it is disturbing. Sublime is freely available but if you wish, you can get license also by paying fees. Currently, I am working as a developer and I have to create web pages. I found sublime is helpful while doing this task. I am using this editor since 4 year and i found it is good for a programmer. "Excellent éditeur de contenu textuel"
Le changement de couleur du texte en phase avec son étendue vous permet de localiser 90% des erreurs dans un débogage non marié. Sublime possède une interface graphique complètement riche et une excellente collection de sujets. Il s'agit d'un puissant éditeur de contenu textuel prenant en charge diverses extensions. Son autocompletado est correct, mais ce n’est pas toujours agréable et cela dépendra de la configuration qui est donnée. De plus, quelque chose que je n'aime pas beaucoup, c’est que les plugins sont incroyablement difficiles à installer. Je n'aime pas que les add-ons et les outils soient téléchargés à partir d'une console de commande, vous pouvez également dire qu'il manque d'options avancées pour le texte. "Très puissant éditeur de contenu textuel doux"
Cela fonctionne très facilement. Avant tout, le sujet pourrait être très accrocheur et sécurisé à appliquer. Les plugins peuvent être montés comme des serveurs Stay ou Shadow Spotlight. "O melhor editor de texto, o Sublime Text." - Ele suporta muitas linguagens como HTML PHP JS, etc., além de fornecer previsões e sugestões de biblioteca de suporte para cada instrução. Acima de tudo, seu tema é muito atraente e conveniente de usar. É um software fácil de usar. - Não há nada que eu não goste, mas seria ótimo ter aspectos diferentes para o aplicativo. É o meu editor de texto favorito. Nada, este é o produto perfeito, nada a recomendar neste momento. "Uno de los editores de código más perfectos que existen"
- El título lo dice todo, ya sea su html, Python Java, el lenguaje que este editor de texto nunca me ha decepcionado y los temas me encantaron. Es un editor muy ligero y rápido, con el que puedo editar todo tipo de código fuente, es fácil uso y tiene todas las opciones que necesito, su interfaz es oscura, lo que me parece excelente para no dañar mi vista. Me gusta Sublime porque es un editor de código fuente muy útil para mí, ya que es muy ligero y tiene una interfaz muy buena y fluida, me permite descargar complementos desde su consola y me gusta porque resalta el código muy bien. - La instalación de complementos es muy difícil ya que tiene que instalarse a través de comandos (En la gran mayoría de veces), además, la versión gratuita es ilimitada pero siempre aparece una alerta molesta para comprarla. Lo que no me gustó de la aplicación es que, aunque es opcional comprar la licencia de vez en cuando y al azar aparece una pequeña señal que le invita a su compra, esto no parece negativo en sí mismo. - Editor de texto para el uso diario básico de ingeniería Al mismo tiempo, también es importante decir que este software se puede utilizar en Windows, Mac y Linux (Es multiplataforma), por lo que cualquiera de nuestros programadores ha podido usarlo sin importar el sistema operativo que tengan. En su portátil. Obviamente solo edito archivos de código que no necesitan compilación de código porque no tiene compilador incorporado. "Excellent for programming code quickly"
The sublime text is also slow in searching for multiple files. Nothing, this is the perfect product, nothing to recommend at this time. I don't like that the plugins and tools are downloaded from a command console, you can also say that it lacks advanced options for the text. It provides top down view of file and keyboard shortcuts txt Obviously I only edit code files that do not need code compilation because it has no built-in compiler. "Buen editor de texto y de facil uso"
Es uno de los editores mas veloces que he usado, tiene una interfaz muy comoda de usar. Lo que mas me gusta y la razon por la cual utilizo Sublime Text, es la seleccion multiple, la cual me permite realizar seleccion rapida de varios textos. Sinceramente me gusta como funciona, tiene la capacidad de seleccionar temas para adaptarse mejor a las horas de luz o los horarios nocturnos para que se canse menos la vista. No me gusta que tenga pocos temas para elegir, y tambien es dificil instalar nuevos complementos. Tampoco tiene complementos para archivos a traves de FTP desde la propia aplicacion. Por otro lado no tiene forma de conectarse a bases de datos, ver las tablas y campos . Recomiendo SublimeText si necesita una aplicacion fiable, sin licencia obligatoria (se puede tener una ya que es opcional) y que ademas sea facil de usar y potente al mismo tiempo, sobretodo cuando se manejan archivos grandes. Trabajo como diseñador web y uso Sublime Text como parte de mis programas para trabajar. Puedo codificar sitios web para que mis clientes puedan estar orgullosos y tambien puedo ayudarles a promocionar su negocio. - Por encima de todo, su tema es muy llamativo y cómodo de usar Admite muchos lenguajes como HTML PHP JS, etc. Además de proporcionar sugerencias de predicción y soporte para cada instrucción. Es un editor de texto sin problemas con funciones avanzadas para la búsqueda y también proporciona macros. - Nada, este es el producto perfecto, nada que reprochar en este momento. Para ser un editor es más que ideal en cuanto a programación si no necesitas trabajar bajo un lenguaje muy exigente, o bajo frameworks, en caso de ser así, necesitarás un IDE, no olvidemos que esto es un editor de texto. - La forma en que podemos organizar el código es excelente y muy beneficiosa porque puede tener todo bien organizado, lo que beneficia enormemente al proyecto. Ha estado utilizando texto sublime para crear páginas web. "Increíble editor de contenido textual, muy agradable de usar"
Normalmente, para simplemente editar unos pocos documentos rápidamente, puede que no haya problemas, pero si usa el software como si fuera un editor sofisticado o un IDE, debe examinar todo su acceso directo y es traumático si está acostumbrado a otras aplicaciones con teclas diferentes. combinaciones Lo que menos me gusta es que a veces este sistema permanece atrapado y es un toque lento aparte de que algunos de los equipos creo que tienen que ser renovados. "Un buen editor de textos"
Las características que me gustan mucho y son por las cuales utilizo Sublime Text, son la selección múltiple, la cual me permite realizar selección rápida de múltiples textos. La opción de cursores múltiples me permite generar o crear texto en dos partes del documento de manera rápida. Me permite realizar un remarcado de la las sintaxis de forma muy fácil, lo cual facilita la ubicación de algún comando y el entendimiento del código que se esta escribiendo. Permite tener múltiples pestañas abiertas sin consumir una gran cantidad de recursos del computador, se pueden ejecutar una gran cantidad sin que se pueda percibir alguna degradación del rendimiento. Es uno de los poco editores de texto y/o comandos que se encuentra disponible para múltiples plataformas, de esta manera el desarrollo se hace mas fluido ya que se puede iniciar en un equipo MacOS y terminar en un equipo Windows sin dificultad alguna. Tal vez lo que menos me agrade de Sublime Text es el precio, el cual considero bastante elevado, si bien la aplicación es bastante completa, siento que el precio hace que tomar la decisión de comprar la aplicación sea mas difícil, ya que es un editor de texto. En necesario evaluar correctamente si es necesario realizar la inversión si no se tendrá un uso continuo de la aplicación, ya que este es algo elevado. Ayuda a mantener un código ordenado, y se puede realizar una identificación del mismo de manera rápida. "Very powerful light text editor"
The best of Sublime text is that it is an application that works in any field, it works as a simple text editor or as an advanced editor for programming and even to handle projects of a certain size. Where the application really stands out is in the handling of large files and especially those that handle a large number of lines per file, in many editors this is a well-known problem and when they have to handle these files always give problems or slow down causing lags etc ... with sublime text this does not happen, I have opened files of millions of lines without problems or lag of any kind, it is definitely their strong point. The only negative thing about this editor is its learning curve that is somewhat high, at least for the most advanced features of the editor. Normally to just edit some files quickly there is no problem but if you use the application as if it were an advanced editor or IDE you should learn all its shortcut and it is annoying if you are used to other applications with different key combinations. I really recommend Sublime Text to anyone, even if you are not a programmer, as a text editor to replace the notepad that windows bring by default since, besides being very ugly, it is too simple and sublime text is superior in everything. I am using Sublime Text as a text editor for quick modifications in my projects such as fixing small bug or editing configuration files of my applications, in this sublime text environment it is excellent and fulfills. "Awesome tool for text and code editing"
Sublime Text is a very simple application to use and without too many options in which to waste time, so its learning curve is very fast. - The default theme of sublime text is very beautiful and does not tire the eyes after hours of programming or reading. - It is available for Windows (I use it at work) and Linux, which is what I use at home, both versions are identical and work the same. Although I have used it to program in Java at times, I would not use it for this task again because for desktop languages it is essential to have a good debugger and Sublime text does not have it. I also did not like the appearance of the unregistered application window so continuously. I recommend SublimeText if you need a stable application, without a compulsory license (it is optional and not open source) and that is also easy to use and powerful at the same time, especially when handling large files. I am using the application mainly to edit configuration files and make quick fixes when I find a bug in my PHP, HTML or CSS codes. "A very useful and powerful text editor"
It is an user-friendly software. It has very good GUI, various theme which helps you to avoid strain on your eyes and work well in night mode. It has good navigation bar and scroll bar which helps anyone to move easily throughout the document.The replace is also good functionality provided by this editor. One of the best feature of this text editor is a multiple cursor. If you want to change or add something in the document at multiple places then there is a more than one cursor provided by sublime so you can concurrently update. I am using this software for the last 4 years and i do not find any disadvantages. I am satisfied with this product. It is freely available and you do not need to purchase licences to use it but if you wish to buy then you can do it. If you have not purchased then window appears randomly asking you to purchase which i don't like. I am constantly looking for a text editor which fulfill my developing need by displaying code very nicely. "Stunning and powerful lightweight editor"
Sublime text is an incredible tool that I have been using for 5 years, in all this time they have improved a lot that was almost perfect in its beginnings, there was no other application of its type that was as powerful as this one. - It is capable of opening files of thousands of lines without any type of problem or lag, this is not something that any editor can say, I dare say that there is no editor that exceeds Sublime text in this aspect. - The default theme sublime is beautiful, in fact it is a theme that has inspired many others and there are even copies with the same name. There is nothing that I do not like about this editor, but to say something, for example, Although it is free, it is possible to buy the license, if you do not do it, a window appears randomly asking you to buy the sublime text license every time you save. I recommend Sublime text if you are looking for a text editor with optional license, powerful, stable and capable of opening files of millions of text lines without the application crashing. I needed a multiplatform text editor, powerful and simple, Sublime text has it all and also the purchase of the license is voluntary. "Great extensible text editor for coding"
Sublime Text is a solid text editor with all the features you'd expect. We use it because it is extremely extensible, and has numerous plugins available for it. For example, we program in ActionScript, ExtendScript and other less-common languages, and we are able to easily add appropriate syntax highlighting plugins for anything that isn't available out of the box. The command line is useful and the licensing cost is very fair. Not much. The default behavior of "paste" should probably be replaced with the "replace and indent" behavior by default, since indenting is necessary in most programming languages. 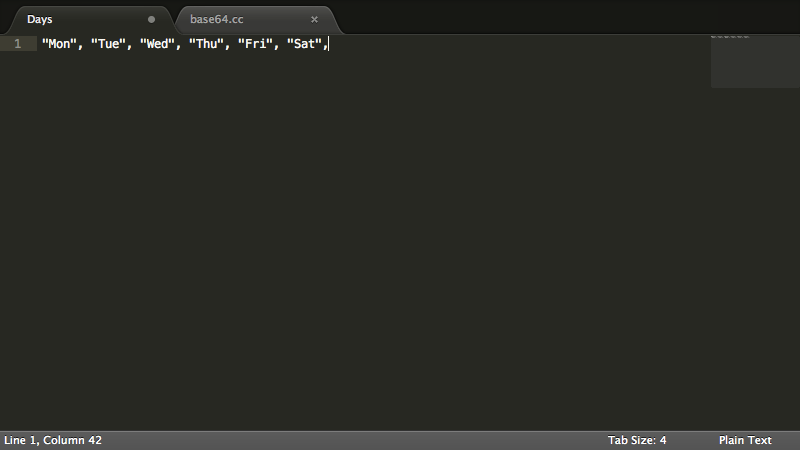 Luckily the keyboard shortcuts for these command can be easily swapped using the key-mapping feature of Sublime Text. This is a solid choice, and is becoming an industry standard for a light text editor for coding. We needed a dependable, extensible text editor that didn't get in the way. Sublime Text fits the bill, and is flexible to work well with the languages we use most. "Incredible text editor, very easy to use"
In the company we solved to be able to use a lightweight and easy-to-use editor, besides being able to use this applications in computers with limited resources. At the same time it is also important to say that this software can be used in windows, mac and linux, that is why any of our programmers has been able to use it no matter what operating system they have on their laptop. "Sublime makes you code easily. The best text editor, I have ever used." I am using sublime for the last 4 years. I am satisfied with the product. I didn't find much disadvantages.But user interface can be improved. I recommend sublime for all programmers. It is very easy and helps you lot in coding. Sublime is very easy to use and very helpful in coding. I have been using this product for the last 4 years and I have never thought to switch to another text editor since it meets all my needs. You open multiple folders and switch your works very easily. Also to save, edit and even rename any files very easily. It makes coding really easy and saves your time a lot. Thank you team behind this wonderful product. "Excellent text editor for programming"
"The best multi-platform text editor for programmers"
It has a lot of features such as its shortcuts, IDE like features, custom snippet setup and also a lightweight text editor, there is no need to touch mouse in most cases. it supports most of the programming languages and their frameworks with the help of snippet packages. It is a very powerful text editor and it is very light-weighted and also supports a large number of languages such as C, C ++, TypeScript, Java, HTML, CSS, SASS, XML, C#, git, Laravel blade etc. I am facing few problems with sublime nowadays after a long time. it hangs while I am working on a project that has a lot of child directories. it does not work well with typescript (programming language) because there is no feature like auto import file yet. It is the best text editor since I am using till now. Every programmer & IT professional must have this editor. I surely recommend to my colleague. A rich amount of shortcuts and extensions helps to work fast. As a designer I have used different code editors, what I like about Sublime Text is that you can code with different languages. I personally write HTML, CSS and PHP. be able to write code in different languages provides simplicity for me and don't have to use different programs at once. I hope there was a cloud sync option, but unfortunately there is not one, at not at the moment, maybe that's something the Development team can work to provide in futures upgrades and releases. I work as a web designer and I use Sublime Text as part of my tool set. I can code websites that my clients can be proud of and also can help them promote their business. "The best text editor for programming lovers"
Since I use it, it has allowed me to complete a great variety of projects for my company as well as personal projects with great fluidity with the way it allows browsing between folders and files. The simple and easy interface of sublime text makes coding a lot easier as well as the support to customize the code editor from scratch is an excellent addition which makes it stand out from the others. The pricing can be made more economic for developers who are on a tight budget for the development of projects. I myself feel that the pricing can be improved in terms of paying for the application. If the team manages to reduce the pricing , a lot of developer folks out there may get onboard the 'Sublime' journey. Other one is the package control can be made more intuitive and more demanding for more integration in the process. 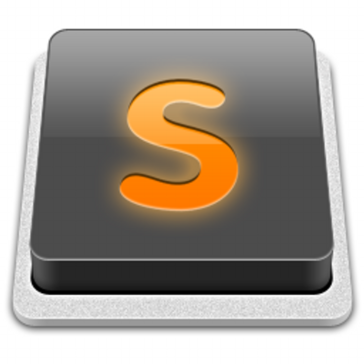 Despite being lightweight, Sublime text should provide more simulators and heavyweight modules as a full fledged IDE. People can obtain more insights from editor for data science if Sublime Text provides functionalities like graphical outputs, visualizations and demographs. This is the best text editor for everyone out there. Sublime text facilitates advanced interface while product/project development for an advanced developer like me as well as being simple for a novice at the same time. I develop all of my front end web applications on it. Many of our clients include people from the engineering domain that tend to solve a lot of real world problems with code. And no doubt, Sublime text has been at the forefront in development phase. The part I like the least is the learning curve. At the beginning it is necessary to devote a lot of time to be trained about the characteristics of this software, since otherwise it will not be possible to take full advantage of it. In this way I would become a very simple text editor. In addition, to do some very basic tasks it is necessary to download certain features through plugins, which increases the installation time. It's difficult to manage large projects with it too. It is important to dedicate a lot of time to training in this software to get the most out of it. It is also recommended to install some basic plugins. "My favorite text editor, Sublime Text." Sublime text is my favorite cross-platform source code editor. It’s lightweight and easily customizable. Sublime text comes with features that make programmer’s life easier. It supports many programming languages, allows plugins additions, efficient search and replace features, customizable keyboard shortcuts, syntax highlighting and the fact that with all these it’s still easy on your computer resources. Sublime Text don't have run or live preview support and GIT does not integrate well yet. Apart from that it's still my all time favorite. There are many text editors available but Sublime Text is a must. It has a friendly interface, it’s lightweight and supports a variety of programming languages. Text editing becomes easy and fast with this tool. If that is what you are looking for go ahead and try it. Sublime Text cuts my coding time greatly by allowing multiple cursors and selections, autocompleting, support for many programming languages, effective search and replace. We use Sublime Text to develop applications using different languages without the need of having an IDE for every language. "The all in one editor"
The sublime text editor is a lightweight text editor, it supports various programming languages like c++, HTML, CSS, Java, Python and lot more, sublime text has a better-organized menu than another editor like notepad++, it also provides autocompletion of various existing variable names, it also supports various plugins which would make it as a better compiler for coding also, with sublime text you can see the code preview as you write codes at right corner which helps you to see the code if the code is long ,there is also versatile of themes that sublime support user can set themes according to their likes. With the help of plugins, one can use sublime as an IDE for programming but sublime doesn't provide enough tools to make it suitable for a programmer to code like debugging which is one of the most important features any IDE should have but sublime lacks in all of this. I would definitely recommend sublime for the web developers as it is very lightweight and full of features for the one needs for web development but not recommend to use as an IDE for programming purpose with languages like c++ or Python because it lacks many tools needed for the coding purpose. I have used sublime for making some webpage in HTML, CSS and I very impressed the way sublime manages each file, as it very important for web developers to manage files because will developing a website one has to make lots of files and if it is not organized it became a mess. "Codify your projects comfortably with this editor"
Sublime text is a very simple but powerful editor with which I can edit my source code, it allows me to use different programming languages, I can add add-ons to be able to have more support to different programming languages, its autocomplete is good and it helps me write more quickly, it also has very useful keyboard shortcuts. The installation of add-ons is very difficult since it has to be installed through commands, in addition the free version is unlimited but it always appears annoying alerts to buy it. If you are looking for tools to easily develop your code, sublime text is a good option for simple developments. In my work I use this editor because it is very easy to edit my source code, also because I can run it on almost any operating system. "The best text editor for almost all projects"
Sublime text is one of the fastest text editors and, with the best keyboard shortcuts that exist in the market, it is undoubtedly the best option if you are looking for productivity and efficiency. Its wide range of accessories makes the experience at the time of development very good. I really enjoy using this development tool on all my PCs, regardless of the operating system I am using, I know that the experience will be the same in all of them and even more important is that the sublime text does not consume much resources at the time of work intensive with this text editor, fully recommended if your computer has few specifications and you want to work quickly. The least amount of updates is the biggest problem of this editor, with time you will get to notice the absence of features that other competitors in the market have. It also lacks some native feature and easy to use that allows the synchronization of plugins and personal settings of the user on the text editor, it can be improved in the same way the interface of adjustments of Sublime Text, making it more amenable to the end user and ordering it in a better way. Take advantage of the test time to determine if the product is suitable for your consumption. "The best editor you have used for several years"
The projects can be easily managed with sublime text, it also has a large number of packages and extensions ready to install that help me expand its functions, another advantage is that it is a very light editor with excellent support for web programming languages. I have had performance problems reading large files. It's not free and I think $ 80 for a personal license is too expensive, especially since its strongest competitors are free. I recommend using the free version to explore all its functions before deciding to buy a license. It is really worth investing for this excellent editor. Recommended. This software makes the work much faster and easier, since it has an excellent autocomplete control. It does not consume many valuable resources on the computer and this is a huge advantage over other publishers. Sublime text es un programa utilizado ampliamente por programadores profesionales para la edición de texto y código. Es muy fácil descargarlo desde el gestor de aplicaciones de Linux, es compatible también con MAC OS y con Windows estando disponible para este Sistema Operativo en la web (sublimetext.com), tanto en modo installer como portable. Fue programado en c++ y phython. - Permite varias pestañas abiertas a la vez para editar de forma multi-archivos. - Soporte a múltiples lenguajes de programación. - Buscar palabras dadas y reemplazar por las deseadas. - Distintos niveles de colores según la sintaxis del lenguaje de programación en uso. - Aunque sea de pago, se puede descargar de forma gratuita una versión de prueba que es plenamente funcional y no tiene fecha de caducidad. Mini mapa a la izquierda para ir desplazándose por el código. Numeración de línea que facilita la lectura y búsqueda de errores. Podemos tener hasta 4 ventanas en paralelo simultáneas de código, ideal para cuando trabajamos con dos pantallas. Marcado de llaves, paréntesis o corchetes cuando el usuario se sitúa encima de una de ellas(para darse cuenta de si te dejas alguna sin cerrar). Posibilidad de utilizar atajos con comando rápidos en Sublime text. Es software propietario y no es de código abierto. No es gratuito, y aveces es molesto el mensaje que sale de manera continuada recordando al usuario que debería pagar la licencia. A veces falla al añadir pluggins nuevos que se descargan de Internet. Requiere un periodo de aprendizaje algo alargado, hay que dedicar mucho tiempo a comprender las características de Sublime Text, así como a comprender las capacidades que puedo cubrir y las que no con este software, porque si no investigas y averiguas funciones, se te quedará en un editor de texto de lo más simple, como los muchos otros que existen. No hay opción de vista previa en tiempo real, algo que ayudaría bastante en el diseño de páginas HTML5 y CSS. A veces falla al instalar algunos paquetes de idiomas. No permite el trabajo colaborativo entre miembros diferentes de un proyecto desde diferentes dispositivos a través de la red o Internet. Recomendaría a todos que usen sublime, pues aunque no es tan fácil de usar como otras alternativas en el software libre, Sublime muestra su músculo potencial a la hora de aportar capacidades y funciones no tan vistas en otros editores. Dedíquenle un pequeño tiempo de aprendizaje sin exasperar y Sublime Text se mostrará agradecido con usted. Nosotros usamos este editor para realizar pequeños programas en clase en los lenguajes C++ y HTML5 con CSS y Java Script. Es un editor de mucha potencia y capacidades que para realizar proyectos muy básicos con los estudiantes quizás no estemos sacando todo el partido y haya herramientas más recomendables como Notepad++... Pero nos encanta probar cosas nuevas y funcionamos tanto con NotePad++ como con sublime Text.